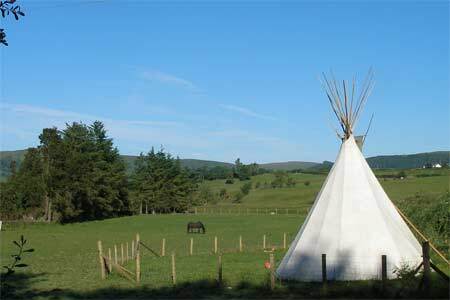 ﻿ Mid Wales Bunkhouse Tipi and Camping. Booking terms and conditions for the tipi. Tipi booking terms and conditions. A provisional booking can be accepted by telephone or email, but must be confirmed with a deposit of 30&percnt; of the total booking cost. Deposits are refundable subject to the conditions below. We reserve the right to re-let if you do not arrive on the arranged arrival date, unless you have notified us of any change to your plans. Any cancellation must be in writing, and the following charges will apply, calculated from the day that your cancellation notice is received. Over 6 weeks prior to arrival date - Refund of monies paid. Less than 6 weeks but more than 3 weeks prior to arrival date - 50% of cost of stay. Less than 3 weeks prior to arrival date - 100% of cost of stay. In the event of circumstances beyond our control after your booking has been accepted, we reserve the right to offer alternative accommodation, such as beds in the bunkhouse, which will be at the original booking cost. If you choose not to accept any alternative offered we will refund in full the cost of your booking. If no alternative can be offered, we reserve the right to cancel your booking at any time up to your arrival date, by telephone to the number held on the booking details or in writing to the email or postal address provided at the time of booking, in which case a full and immediate refund of all monies paid will be made. Under no circumstances will our liability exceed the amount paid for the original booking. The tipi is only for the use of the persons signing the booking in register. The tipi is equipped to sleep up to 6 people but will sleep up to eight people as a maximum. This numbermust not be exceeded. Pitching a tent or parking a caravan will incur additional charge. The tipi is equipped with simple billy can sets for cooking, and mats, cushions and throws for furnishing. You are required to bring your own sleeping bags and mats. Please report any damage or breakages at the time they happen. An inventory of items provided for your use will be provided on arrival. On departure the tipi should be left clean and tidy, as you found it. We reserve the right to inspect before departure and charge for any broken or missing items. No animal of any description be accepted for tipi bookings. Anyone travelling with an animal will be expected to make suitable arrangements for its proper care and accommodation elsewhere. If this is not possible the right is reserved to refuse accommodation to the owner and animal, and, should this be the case no refund of any monies relating to the booking will be made. 1. No fires to be lit anywhere other than in the chiminiere, or for a barbeque outside. Portable stoves are not allowed within the tipi. 2. Please take great care when starting and attending to the chiminiere. If you are unsure or have problems please seek our assistance. The chiminiere must be extinguished completely before you go to sleep. This should be done by allowing the fire to die down naturally. Never tip water or anything else into the fire. 3.Do not burn anything except the charcoal provided on the chiminiere or on any barbeque. The lighting of fires other than within the chiminiere or barbeque is strictly forbidden. Extra charcoal can be purchased from us. 4. The fire guard must remain in position at all times, and properly closed unless actually attending to the fire. 5. All candles and naked flames to be kept well within the guarded area and extinguished before retiring to bed. 6. No smoking in the tipi. 7. Any barbeque should be sited at least 3 metres from the tipi, and in windy conditions must be on the leeward side of the tipi. Please dispose of all rubbish in the bin provided, and glass bottles in the crate. Please close all gates firmly. Have an enjoyable and safe stay at Woodhouse. It is a condition of booking that you have read, understood and agree to be bound by these terms and conditions. Those conditions shown in red are for your safety and must be adhered to absolutely. Please ask if you are in any doubt whatsoever.